Jordan has been ill for over 30 days now. She has not been able to keep food or liquids down for more than a couple hours and has lost around 25 lbs. She has been to the Insta Care 6 times, the ER 3 times, a GI Specialist and has had countless tests completed. She is still currently in the hospital with no results and has been classified as "Failure to Thrive". They have completed many blood tests, ultrasounds, CT scans, brain scans, urine tests, stomach scopes and much more. At this point she is worried about the medical bills stacking up and that is the last thing we want someone in this condition to think about. She has been unable to work and probably won't be able to go back until they determine what is going on. We want all her focus on recovering and getting back to her normal self. We know not everyone is in the position to help but we appreciate every little bit and please keep her in your prayers. Thank you for all the love and support, it means more than you know! Update: Jordan has finally been given a diagnosis with a confidence interval of 95%. The tests that came back last week say that it is Neuromyelitis Optica. It’s similar to MS. They have started a more aggressive steroid treatment, as well as plasma exchanges. We are told that NMO is quite rare, apparently only about 4000 in the US. 50% of the time, it can be a one and done situation. The other 50% experience it on a recurring basis in which it can cause more brain damage each time. We are certainly hoping this is a one time episode without recurrences. 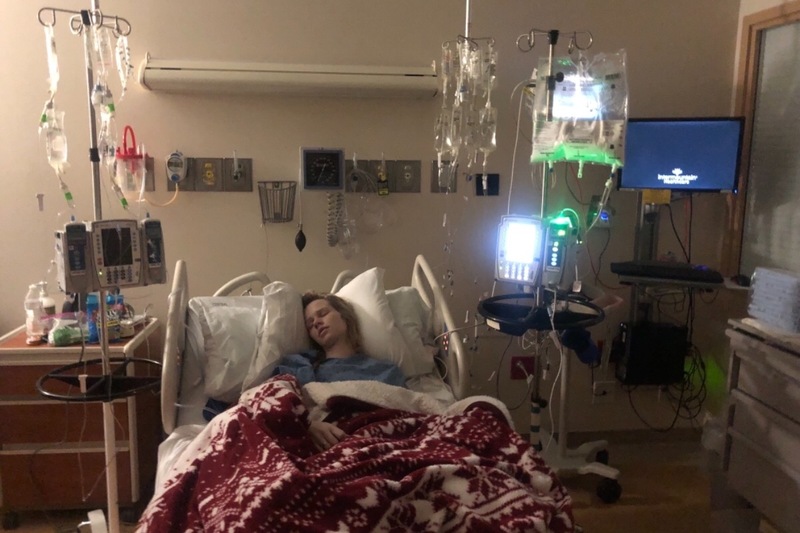 Once the plasma exchanges are through, she will make her way back to rehabilitation (this is still up in the air as she might not have to since she is improving so much!) where she will learn to strengthen her core motor skills which were affected by the Encephalitis. She is improving each day and can finally eat solids again. She is working towards drinking fluids and had her feeding tube removed yesterday! She will complete another barium swallowing test this week. Jordan is an inspiration to us all. She has been extremely positive, brave through it all. Keep fighting, Jo! 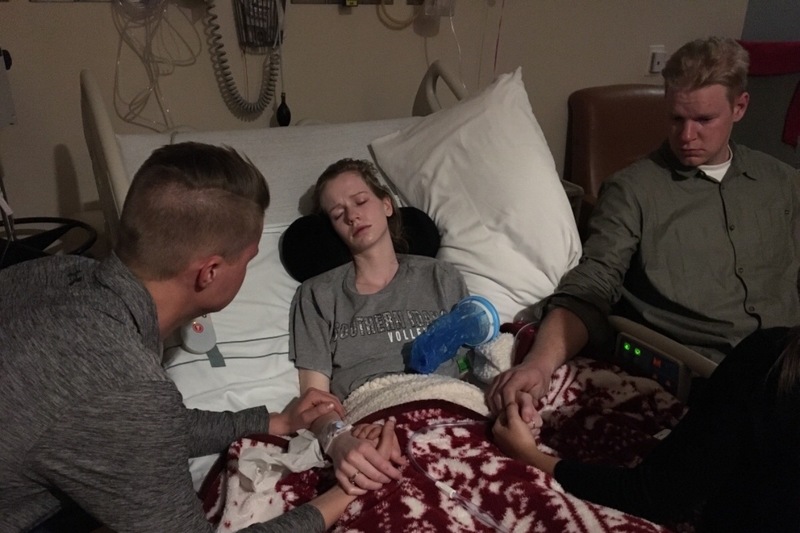 *All funds raised through this Go Fund Me will go directly to Jordan to help with her medical bills. We got some enlightening news this week. The Infectious Disease Dr. just met with us and told us that they are going to start treating Jordan for a virus called HHV6. One of her blood tests came back with a positive hit on this marker so they have sent out more specific tests to verify what they found. They are hoping for the HHV6 test to come back positive within a few days. It is a very rare disease and usually only appears in patients that have had significantly squashed immune systems, (brain marrow transplant patients, etc.) If it comes back positive, she will be the first healthy patient, he has ever seen, to have it. He believes it is a primary infection and not a dormant one in her. If this is what it is, the antiviral medication should take care of it and then she just needs to recover from all the symptoms and should never have any issues with it again. It is the best possible outcome we could have hoped for. Please pray that this is the cause and the test comes back positive. Last night we had a much better night of sleep! She slept for three hours uninterrupted. 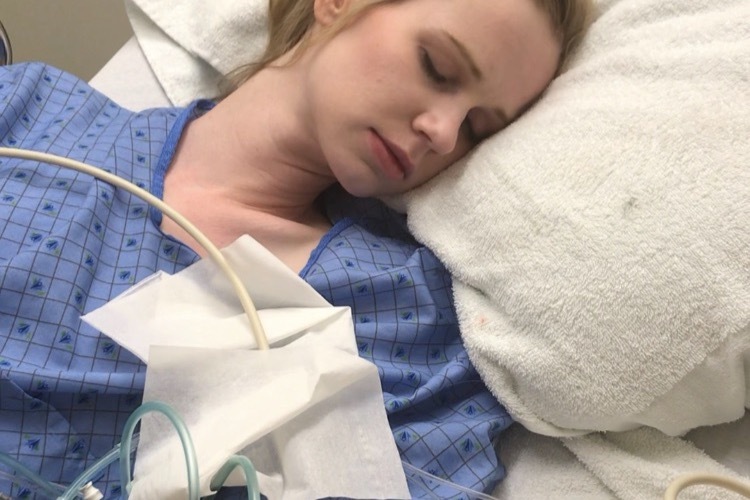 This morning she took a barium swallowing test to see if she was strong enough to swallow solids and liquids, but the test came back showing she is still aspirating. (more so with water, but still some with pudding.) She is doing better, but the speech therapist wants to work on strengthening her swallowing for a week before doing the test again. So, no food or water for another week. She isn’t happy about that. She just wants to sleep. Jordan is now allowed to have 1/4 a cup of ice an hour to help with the recovery process and to keep her mouth and throat somewhat lubricated. She needs to practice on the ice like she is eating food. The doctors are not concerned with the increased numbness in her extremities and now her back however. They feel like this is part of the healing process for her brain. It may get worse before it gets better. They are increasing the gabapentin to help with the discomfort of the sensations. The feeding tube was placed a couple of days ago and they are easing her back into the process of eating. Her phosphorus level came up however, so they are turning down the feeding tube so as to avoid referring syndrome. The doctors are also talking about possibly moving her out of the ICU today, but nothing definitive yet. That is HUGE!! We are going to keep her at IMC for Acute Physical Therapy after she has completed the treatment for HHV6. When she is ready for that they will move her to the 12th floor. We are excited about the progress that Jordan is making as she is starting the recovery process. We have seen incredible miracles and we know that these miracles were wrought by the faith and prayers of all of you. Thank you for your support through this difficult trial. Here are a few photos from the hospital stay. Jordan has been moved to the ICU and now has a feeding tube. Still don’t know exactly what is going on but we will update the page once we know anything. Thank you again for the love and prayers! Update: We are beyond grateful for the outpouring of love, generosity and support for our sweet Jordan. We thank you and ask that we continue this effort to support Jordan. With recent findings, we anticipate her treatment to carry into the new year which will lead to new out of pocket expenses as well as the inability to work for some time. With that, we have decided to increase our goal in support of Jordan. 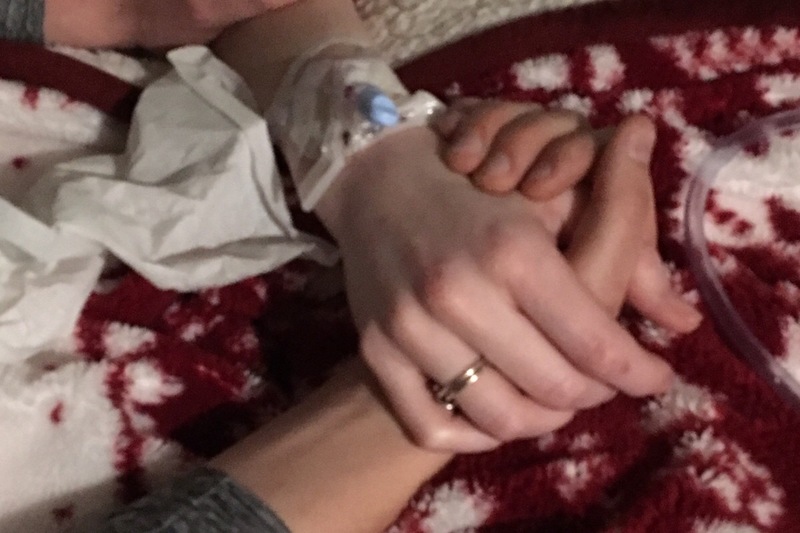 In the past three days, Jordan has undergone numerous tests in an effort to find a diagnosis. Between spinal taps, blood tests, multiple MRI's, EEG, pickline with an EKG (the list goes on and on), Jordan has had just about enough (poor girl!! )...more difficult tests to come tomorrow and Monday. The MRI performed last night and two this morning showed increased inflammation in her brain stem. She has been diagnosed with Encephalitis, inflammation of the brain and stem. Right now they do not know what is causing it, trying to determine if it is Neuromyelitis Optica (NMO), a rare autoimmune disease, or a viral or fungal infection. Further tests being done. Unfortunately, Jordan has been restricted from any food or liquid (she is not happy!!). Inflammation of the brain stem has led to further deterioration: difficulty of swallowing, slurring of speech, and numbing in her extremities, not to mention the extreme discomfort. With her difficulty to swallow, they fear aspiration. We are praying that the antibiotics and steroids they started her on today will begin to take effect. Continue the prayers. We love and appreciate you all.